it’s warmed up a bit and all that pretty snow from the other day is mostly gone. sigh. but that’s typical for december around here – it often snows one day and melts the next. fingers are crossed for a white christmas though! i still have 11 more rows of the shoulder drop section, which i’m hoping to finish yet tonight. but that only puts me a short way into the shawl. not that i’m complaining! like all of anne’s patterns i’ve tried before, it’s an interesting knit. and the yarn is wonderful – a squishy and soft merino. 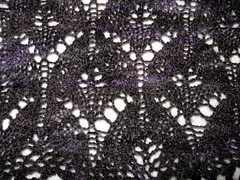 i almost can’t believe it’s laceweight. oooh!! it’s fabulous! i’m so impressed . . it looks great. Oh that is gonna be stunning! 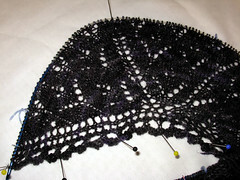 Your shawl is coming along so beautifully! I’ve been eyeing this pattern for a while already as I think it’s ever so gorgeous – looking forward to seeing yours finished!